Every mum wants to do the best job they can possibly manage when it comes to raising their child, but that doesn’t stop you doubting yourself about 37,000 times a day. The other half and I set ourselves weekly goals at the beginning, generally hovering around “keeping the boy alive”, and you know what? Well we’ve managed a whole 12 weeks. In the early days (first 2 weeks) you are desperate to hear good news. News that your bundle of joy will go longer than 2 hours between feeds, news that he/she will go to sleep by 8, news that one day they will sleep through the night (which apparently means just 5 hours in reference books). This is the light at the end of the tunnel that you need to keep going when you’re so sleep deprived you think you pillow is your baby. 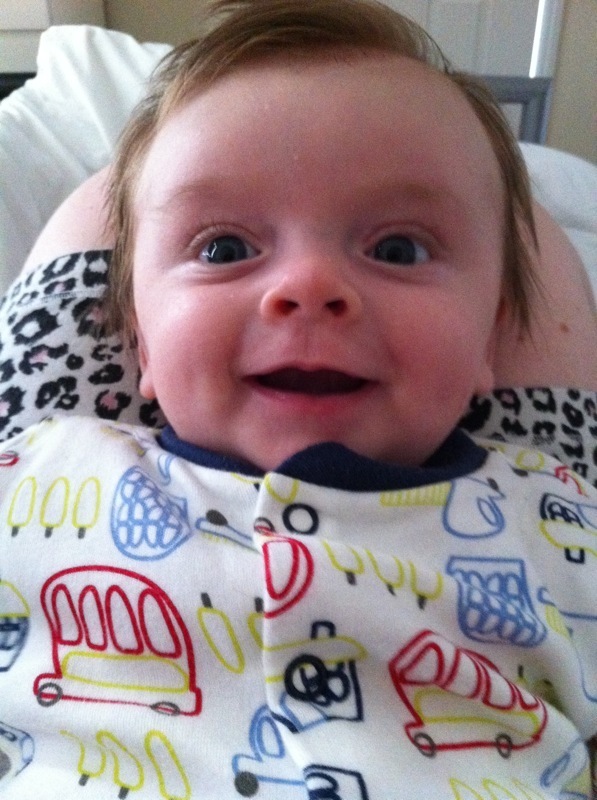 Now the reason I am self-titling myself “Super mum” is because Dexter is just so happy and content. Every morning the cutest little boy I’ve ever met greets me with the warmest of smiles when I lean over to scoop him up out of his bed. The 6:30am starts are all worthwhile when Master K-D gives me the gummiest of grins. The boy is so happy with life and it’s yours truly that he sees every single day. The other half of course has a huge input but he’ll be the first to tell you that spending a lengthy amount of time in just my company is a little bit draining. Dex just takes it all in his stride. His face is full of love when he looks at me and it is just the best feeling in the world. D is at his happiest kicking around on a play mat just watching the world go on around him. I’ll probably make some other mums sick with envy now but he’s even happy lying in his bed at night babbling away before falling asleep with a big grin on his face. I feel my super easy labour and the other half’s laid back attitude plays a big part in why our baby boy is such a happy little person. If he cries we don’t panic, we just get on with it. I’m pretty sure that this first time he’s ill it won’t be pleasant, but we’ll cope. It’s also very hard not to gush to people about the boy; I’ve been tempted to tell strangers in Tesco’s that I have a beautiful baby. They don’t care, but I feel like the luckiest person alive and they need this information in their lives. All in all becoming a mother is the best decision I have ever made and a job that I am guaranteed to have for life. Gush, gush, gush………all gushed out…….